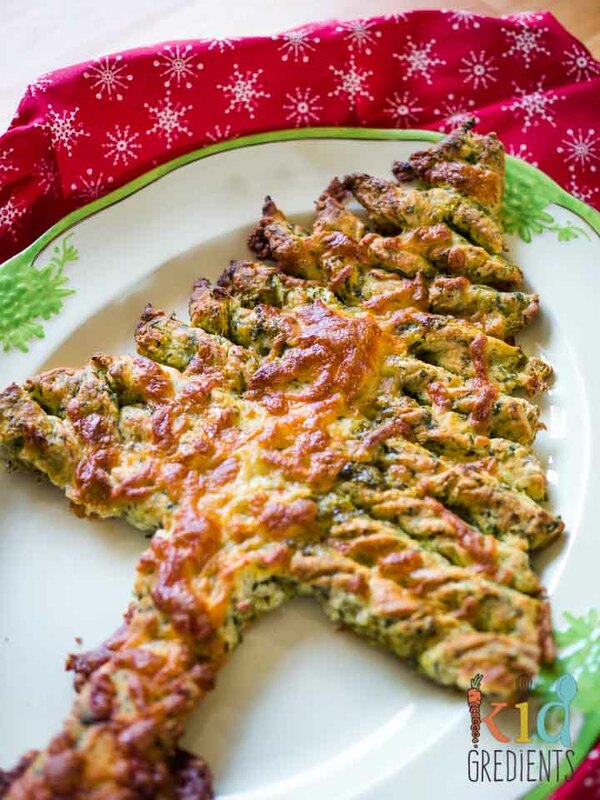 This cheesy pesto Christmas tree is super easy to make! 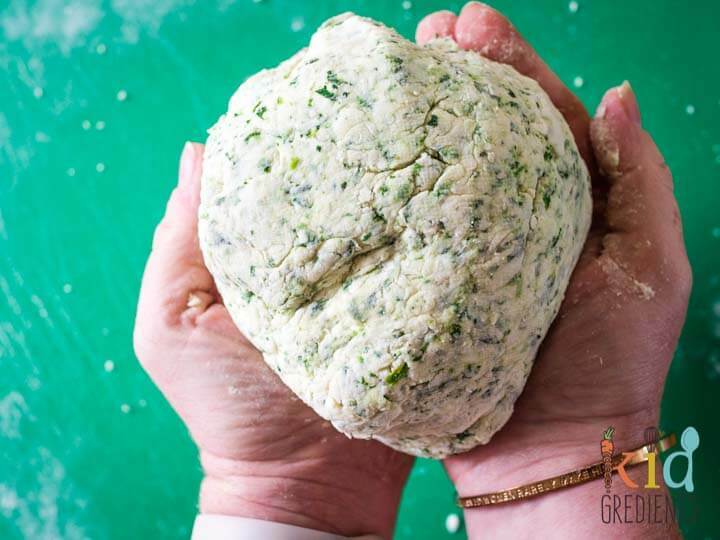 It uses our 3 ingredient spinach yoghurt dough as the base. 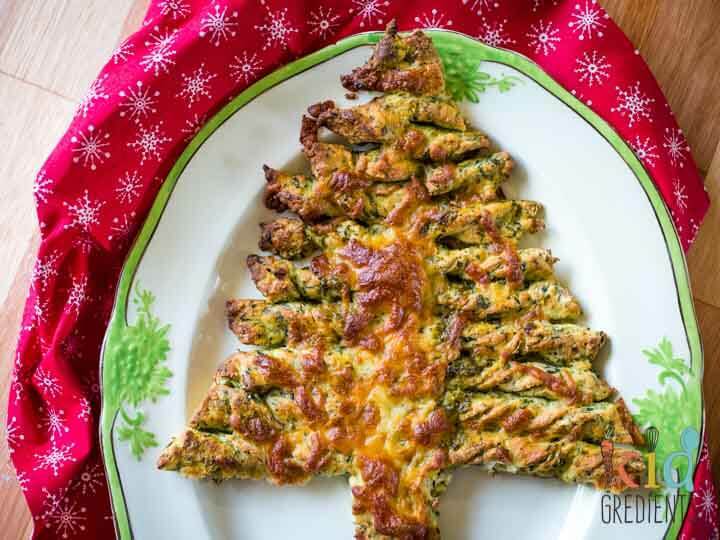 Perfect as a share plate, this cheesy pesto Christmas tree is fun and cute and not too unhealthy. Perfect for taking into school for the end of year parties, or popping on the table Christmas day for everyone to grab a branch. It makes a quick and easy alternative to garlic bread. 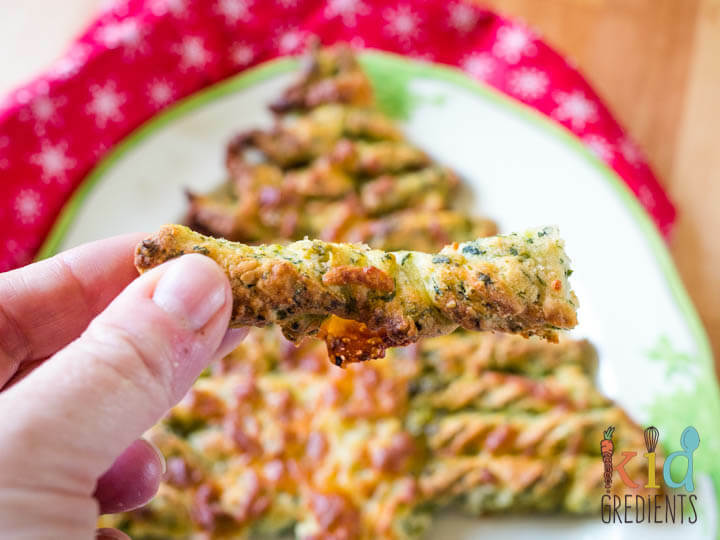 Each individual branch is basically a pesto and cheese breadstick! I freehand cut my tree as you can see in the video and used spinach yoghurt dough to make the dough, meaning a grand total of 5 ingredients are used in making the whole thing. 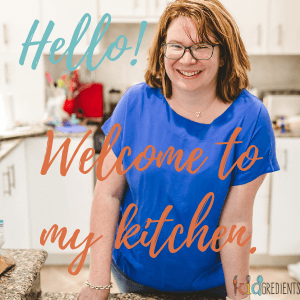 That means there are no tricky things to go looking for and most of the ingredients you will have in your pantry or fridge. Each batch of spinach yoghurt dough makes 2 large trees. I was limited by the size of my oven, but if you have a massive oven you could do this much bigger than I have. My oven is quite small inside, and even standard baking trays are up against the glass! And don’t be shy with the leftover dough- use it to create these fantastic star mini pizzas. You can also halve the dough and do 1 tree and 12 pizzas. The green of the spinach helps these to be more tree like, and how you place the cheese helps to colour the trunk! It’s an easy and healthier option for making fun food without all the colours and flavours. Make sure to twist each branch well as that is what makes it look pretty! 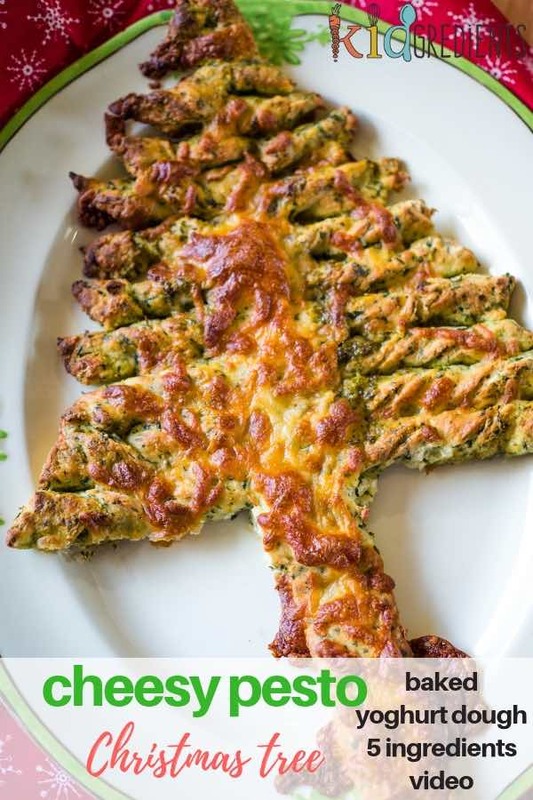 Easy to make and fun, these cheesy pesto Christmas trees are perfect for sharing! An awesome festive treat! Roll out the dough and divide into 2. Cut the tree shape from the dough. 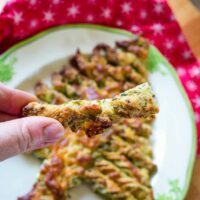 Brush branches with pesto and sprinkle with a little cheese. 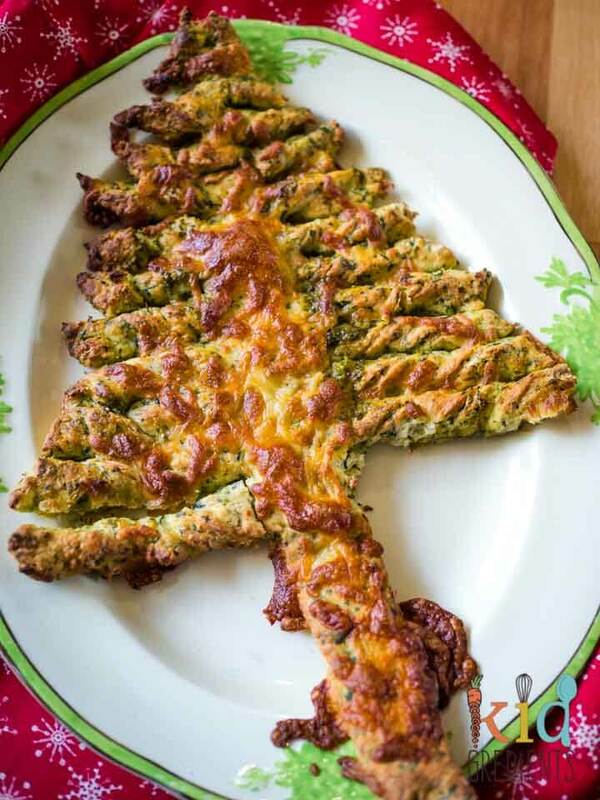 Use the remaining cheese (1/2 cup per tree) to fill the trunk and sprinkle over the rest of the tree. Bake at 180 degrees celsius for 15 minutes or until golden. What a wonderful recipe. 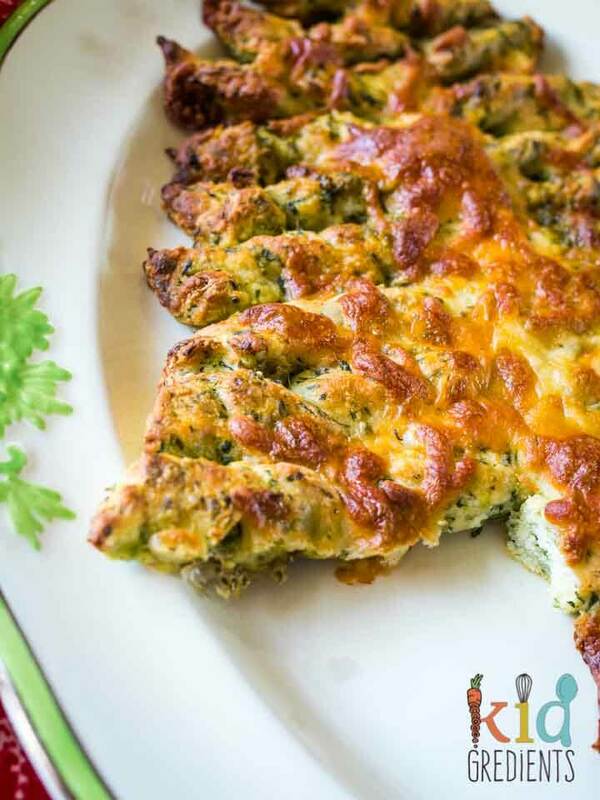 Spinach dough sounds wonderful on its own, but with pesto and cheese thrown into the mix – wow! Thanks Choclette, it is so much fun to eat too!